You are here Home » Dosirak Cafe: Seoul’s Best Kept Secret! Dosirak Cafe: Seoul’s Best Kept Secret! We’re at the Dosirak Cafe (sometimes spelled Doshirak) in Tongin Market this week sampling some lunchtime Korean traditional food from the Lunch Box Cafe. 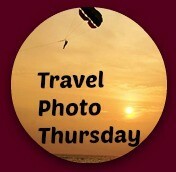 Welcome to week 308 (29/12/2016) of Travel Photo Thursday and our final link-up of 2016. What happened to 2016? Regular readers and contributors to Travel Photo Thursday may remember that I visited Seoul’s Tongin Market on a food tour back in October. 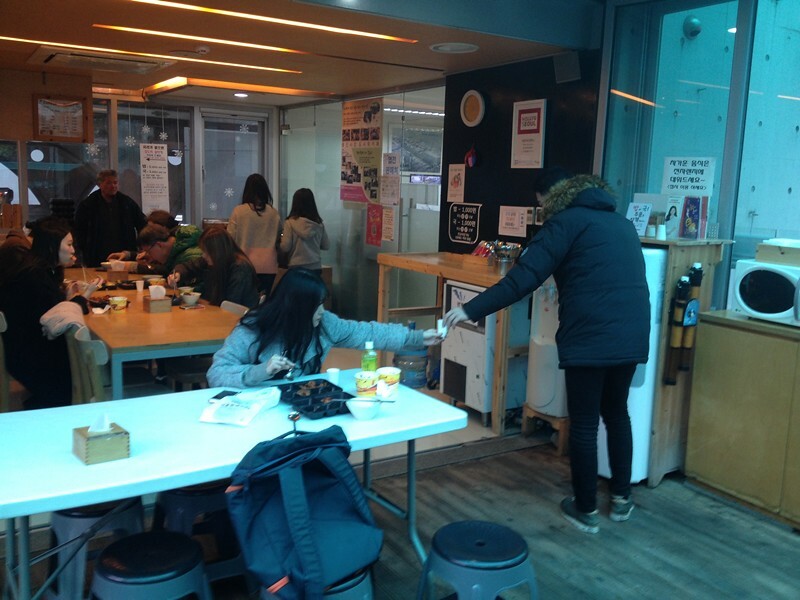 We sampled the spicy giream tteobokki and learned about the Dosirak Cafe (also known as the Lunch Box Cafe). The concept is very simple. Diners pay 5,000w (roughly five U.S. dollars) and receive an empty tray and ten gold color coins. 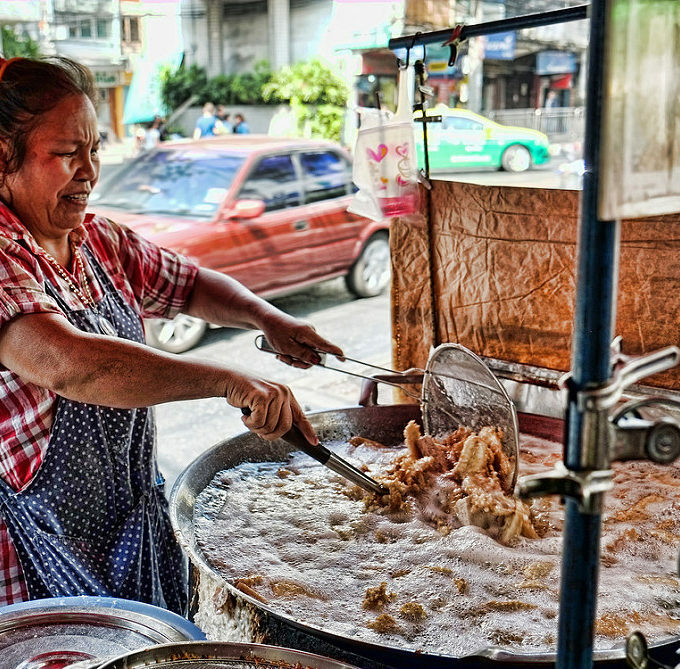 With plate and coins in hand, you wander around the market choosing your lunch from various food vendors. Most dishes will set you back two coins ($1.00). All the dishes in this booth are made from pork. The meat on the left that looks like pork rib is pork (돼지 고기 dwaeji gogi), but not ribs. It is boneless pork wrapped around a Korean rice cake (떡 tteog). My friend tried them and said they were excellent. They are on my list for next time! 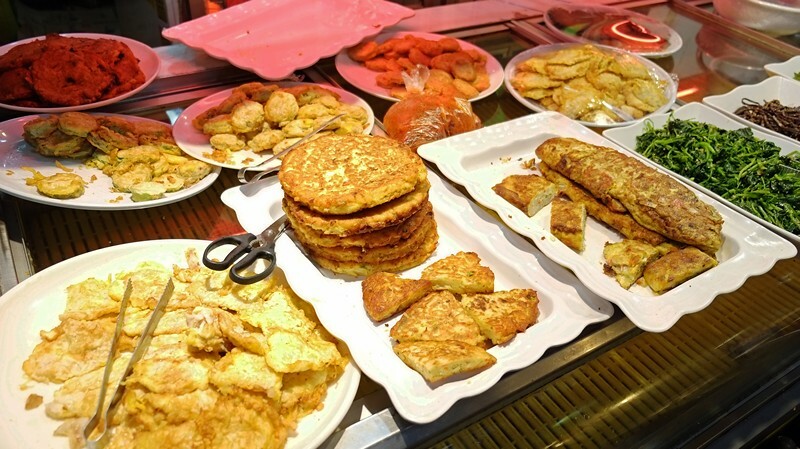 Koreans love their pancakes (Jeon(전)). They come in all different shapes and sizes with a variety of fillings (from spam to Kimchi and everything in between!). The big ones in this photo are mung bean. They’re tasty, but not my favorite because they are often very greasy. I find the smaller ones more to my liking. 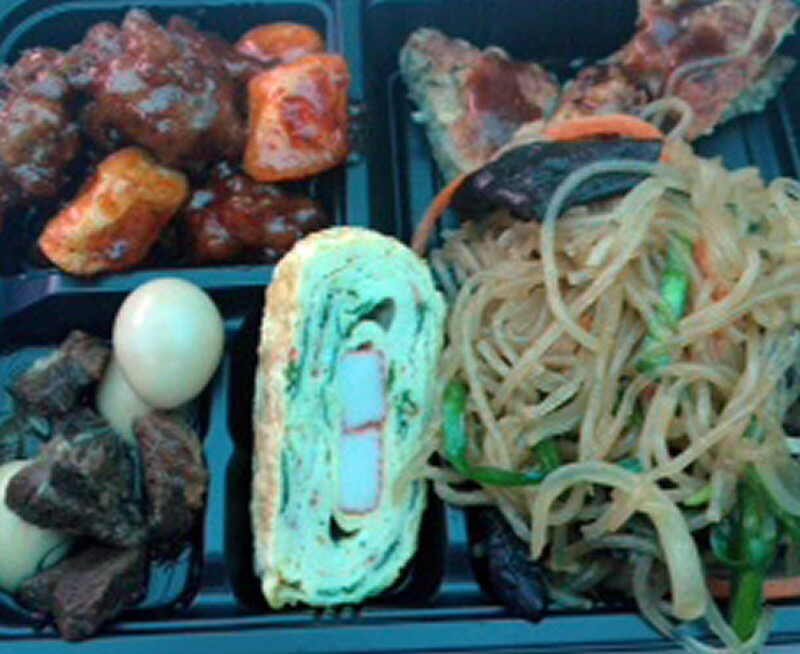 To the right of the mung bean jeon is Korean omelet (Korean Omelet Roll/Gaeran Mari (계란말이)). This is one of my favorites and found a place of honor on my food tray. I gobbled it up as soon as we were back at the Dosirak Cafe. It crossed my mind that maybe I should have gone with just the omelet! There is a large selection of side dishes (banchan/반찬) to choose from. 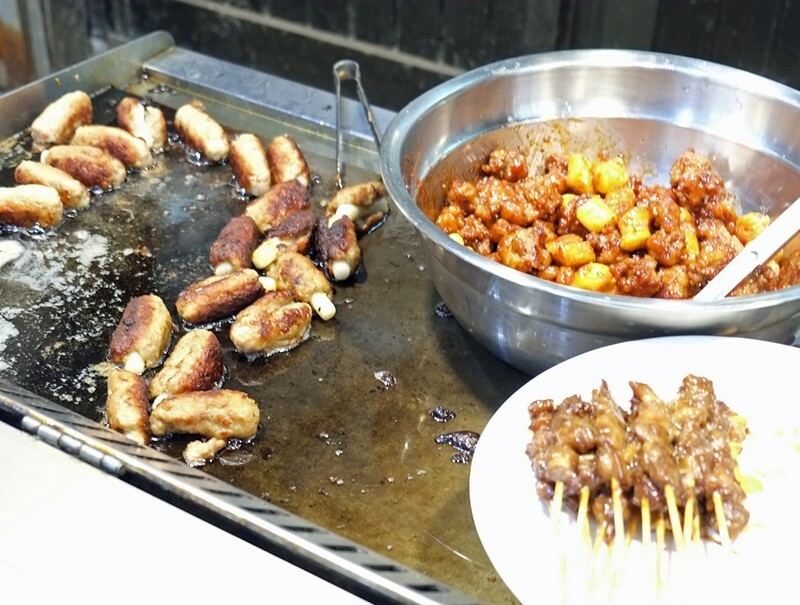 You’ll find everything from Kimchi and various pickled veggies to meat on a stick). Do you know there are over 100 varieties of Kimchi!? This is the tray that I took back to the Dosirak Cafe to feast on. On the left is pork in a sweet sauce with rice cake, next is a type of jeon, then we have beef stewed with quail eggs. Then there is my favorite omelet and finally a healthy helping of japchae. I had to practically run away from the lady. She kept piling the noodles on my tray! I love the Dosirak Cafe and the Korean lunch box concept is a fantastic idea. Although we purposely arrived after the lunch crowd, there were still many locals enjoying their “lunch boxes.” We were the only foreign faces in the crowd on that Friday afternoon. If you’re in Seoul and want to sample an array of traditional Korean food at a very affordable price, don’t hesitate to head to the Tongin Market and the Dosirak Cafe. 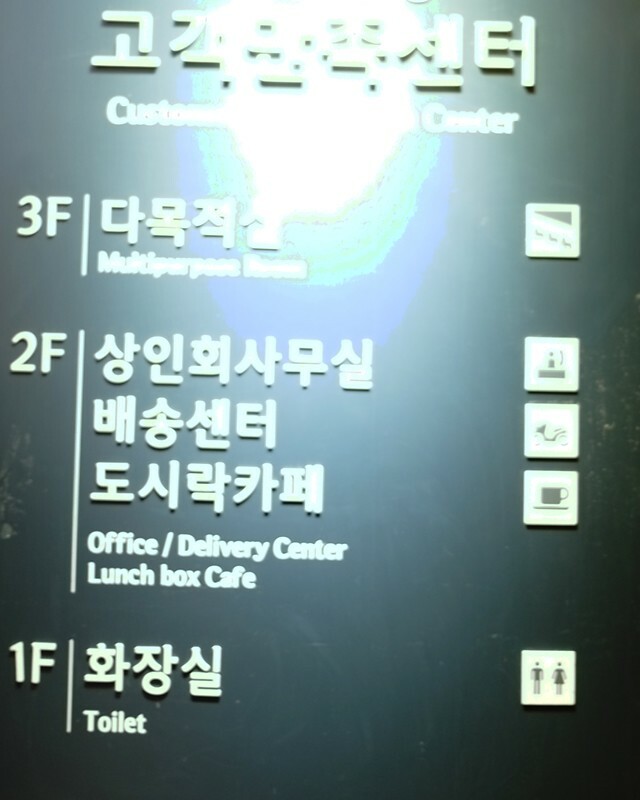 Take subway line 3 to the Gyeongbokgung Palace (경복궁) stop. Leave the station from Exit 2 and walk straight for 4 – 5 minutes. The entrance to the market is on the left. The Dosirak Café’s hours are from 11 – 4 PM every day. Closed on Mondays and the third Sunday of every month. If you want to double check the hours (particularly on Sunday) you can contact Seoul’s tourist information line at 02-1330. 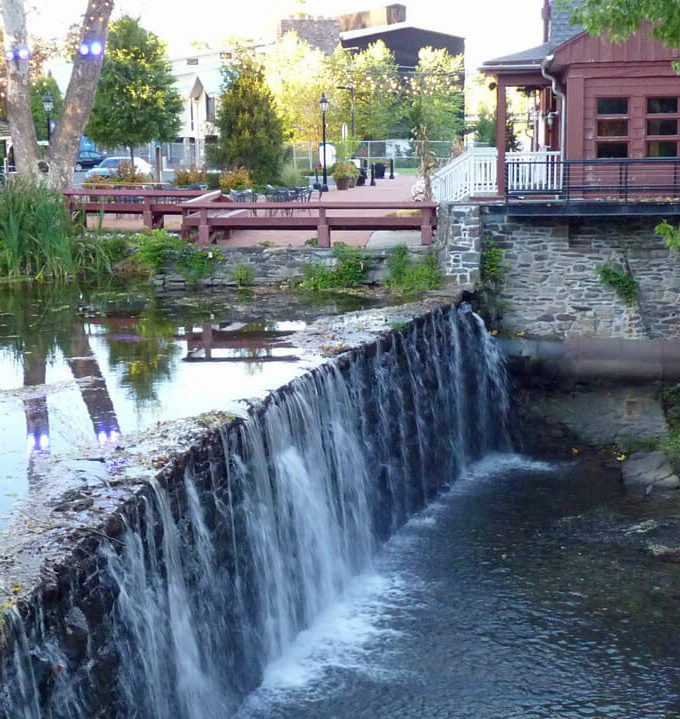 The cafe is clean and pleasant; water is free of charge. There is additional seating on the 3rd floor with AC. Weekends are very busy, so arrive early or later in the afternoon to avoid the crowds. Have you visited a similar cafe in your travels? Let us know in the comments! oooh, now I am really hungry! All of that looks really good – well, maybe not the kimchi! These all look delicious! What a great dining concept. I see some of my favorite Korean foods especially japchae. I didn’t know there were that many kimchi varieties. I’m craving for Korean food now. Wishing you a happy new year! Oh you did it again! My mouth is watering and I am headed to the kitchen as soon as I hit the submit button!!! Happy New Year and thanks for being the inspiration behind #TPThursday. Love this linkup!! Luckily I’d just finished lunch when I clicked on this post. I love the concept and the amount of dishes available to choose from. Can’t wait to see your choices next time you visit. I would like the omelet. Does it have a sauce on it? I wish I’d known about Dosirak cafe when I was in Seoul! I often found it so hard to make choices because all the food looked so interesting. This allows you to try 5 different things! What a feast! You post makes me thing about all the food adventures I want to have in 2017. Thanks for sharing a delicious post to end the year! I like this concept. I’m imagining it as a food stall buffet an so convenient since you don’t have to do the money transaction at each place. The food looks delicious, especially that omelette. I love this lunch box idea! It sounds such fun and a great way to sample new and different foods. foods for a great price. The food looks amazing and I know hubby would be happy with all the different varieties of kimchi. My daughter is planning a visit to Seoul so this is perfect! Have shared etc – we love kimchi and Korean food generally so what a feast! And so cheap! Great way to try lots of it too! What a great way sample a variety of Korean food. Thanks for linking up with #wkendtravelinspiration, see you next week! Hi, Jim! Yes, it really is. I hope to get back again in the next couple of weeks. There were many things that I didn’t get to try! We’re off to Seoul next month and been researching on food places to visit. We would love to visit Dosirak Cafe and I hope they’re still open. I would love the try as much Kimchi as I can. I have no idea that there are over 100 varieties. Hi Clarice. I would be very surprised if the Dosirak Cafe is no longer open. It’s part of a large market, and especially during the summer brings in a lot of business. 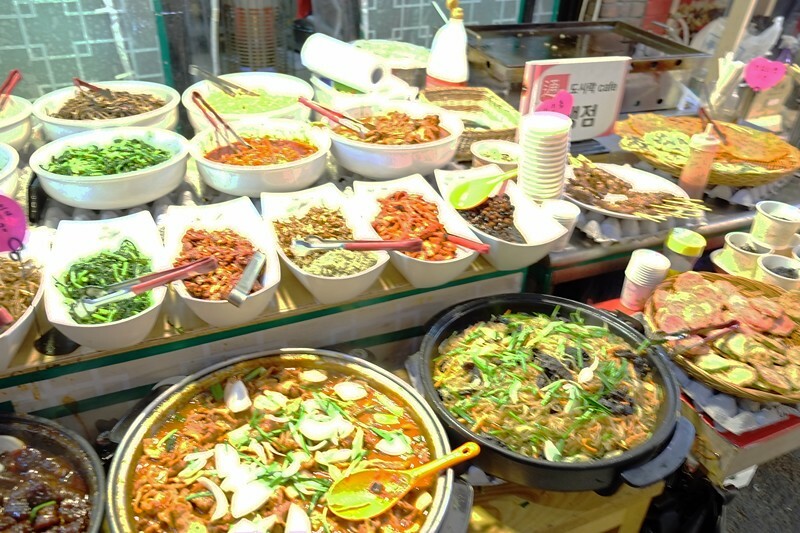 It’s a wonderful way to sample a variety of Korean food.